South Webster’s Taylor Rawlins steps into a pitch. Clay’s Cassidy Wells starts her swing. South Webster’s Gwen Messer goes into her windup. RUBYVILLE — If one knows Clay head coach Jason Gearheart, he or she knows that the veteran hand is a perfectionist when it comes to the game of softball. From the way that the game is played to the way that the field looks, everything has to be as flawless as possible. However, that’s why the Clay softball program is experiencing some of its best times since the Lady Panthers established their winning tradition with three state championships and five state title game appearances within the first decade of its existence from the late 1970s to the late 1980s. As has proven to be the case throughout much of the year, Clay, once again, rode the effective duo of Hannah Oliver and Julia Swain in the circle, along with a red-hot top of the order, to claim victory over the South Webster Jeeps’ softball program as nine hits combined from Jensen Warnock, Shaelyn Vassar, Cassidy Wells, and Lila Brown, along with a dozen strikeouts between Oliver and Swain, allowed the Lady Panthers to garner an 11-3 victory over the Lady Jeeps on Tuesday evening in Rubyville. The win? Par for the course for Clay, who moved to 4-2 overall with the victory. However, it doesn’t make the victory any less impressive to see from the eyes of the very faithful who support them. 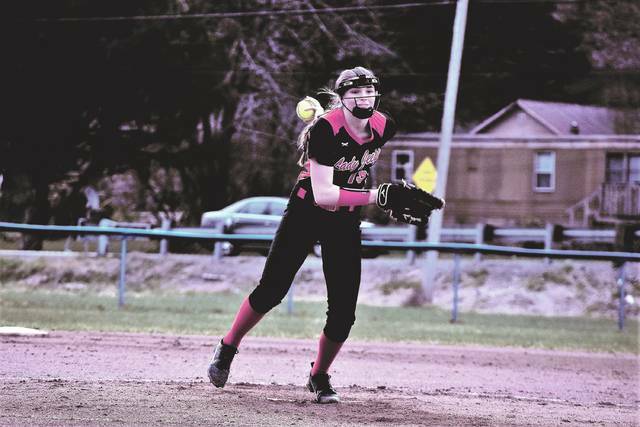 And Andy Messer certainly has provided a spark of competitiveness into the South Webster softball program, which is, as Gearheart said, a much improved unit. Despite only throwing Gwen Messer into the circle in 2018, the Lady Jeeps were within three runs of both West and Clay after four and four-and-a-half innings, respectively, before each unit opened the gap up to close the deal. 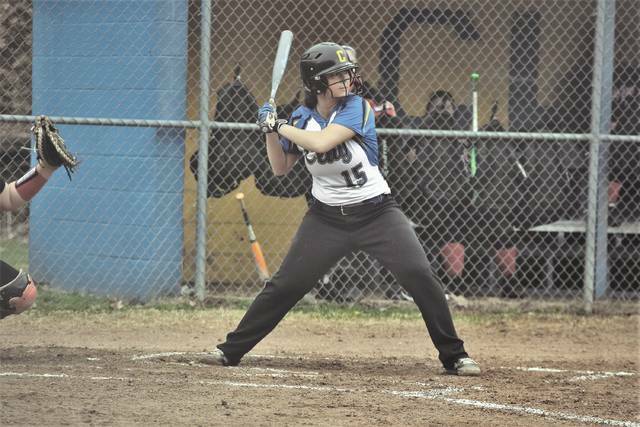 The Lady Panthers and Lady Jeeps, who combined for 15 hits during Tuesday evening’s nonconference affair, both proved to be plenty efficient at the plate. 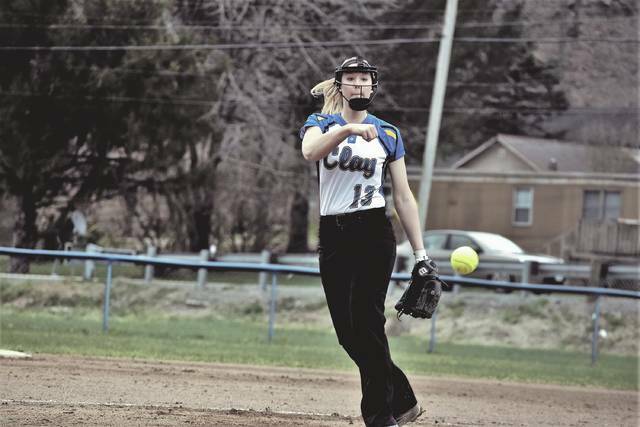 However, in Clay’s case, Hannah Oliver — who fanned six of the first 10 batters that she faced to account for all of her strikeouts — eventually won out. After leaving Vassar stranded on third base in the bottom half of the opening frame following a triple from the junior, Clay didn’t waste a bigger opportunity to strike in the following stanza. A leadoff double from Wells, an infield single from Brown, and a walk from Shaley Munion loaded the bases for Warnock, who launched a rocket of a shot past South Webster’s Kaylee Hadinger in center field. The ball ultimately rolled all the way to the end of the grass before dying just short of the track as all three runners scored on the bases-clearing double to put Clay up by a 3-0 tally after two innings of play, and from there, the Lady Panthers were off and running behind the play of Brown, Vassar, Warnock, and Wells, who went 9-of-14 at the plate with eight RBI, five runs scored, two triples, and a double between the quartet. The scary part? Gearheart believes that Clay can still improve from an offensive standpoint. With the score still at 3-0 after three and a half innings complete, it was Wells’ turn to supply the hit that allowed the Lady Panthers to put up a crooked number. After Elisa Collins was hit by a pitch, Warnock shot a single over toward the left field line and Vassar walked to load the bags up again. Three batters later — and following another hit batsman that allowed Collins to score — Wells supplied two additional tallies by scoring Warnock and Vassar to increase the lead to a 6-0 tally as Clay showed off its ever omnipresent speed on the basepaths. South Webster, however, made things interesting. In the top half of the fifth inning, the Lady Jeeps’ Emma Bailey — who had previously supplied one of South Webster’s two hits prior to the commencement of the aforementioned frame, led off the fifth with a single back up the middle, then moved all the way to third base behind Taylor Rawlins’ single to the left side of the field and Kaylea McCleese’s bunt single. Kaylee Hadinger and Gwen Messer then added back-to-back base knocks — the former collecting a hit up the middle and the latter shooting a ball through to the left side — to cut the lead to 6-2 while keeping the bases full. However, despite a 4-3 groundout RBI from Bri Smith that allowed South Webster to cut the gap to 6-3, Oliver was able to force a second 4-3 groundout to end the top half of the frame with Clay still in front. Clay, however, wasted no time putting distance between itself and South Webster in the bottom half of the frame. After two consecutive walks to start the frame by Collins and Kat Cochran, Warnock scored Collins on another single to left field while Cochran came home on an error to essentially undo the offensive damage that South Webster put together in the frame as Clay took an 8-3 lead heading into the sixth. Then, after working herself out of trouble earlier in the fifth — and throwing five solid innings of baseball where the junior struck out six and walked none — Oliver gave way to her good friend, who closed the deal in the circle. Over the final two innings of action, Swain struck out six of the eight batters that she faced — while only walking one — to seal South Webster’s fate as the Lady Panthers added four walks — including another free pass to Collins that scored Wells — along with a bunt single from Brown and a two-RBI single by Vassar to round out the scoring as Clay took home an 11-3 victory. In the victory, Warnock ultimately led all producers by going 3-for-5 at the plate with a double, four RBI, and a run scored on the evening. Vassar went 2-for-3 with a triple, two walks, and two RBI, Wells went 2-for-2 with a double, two RBI, two walks, and two runs scored, and Brown went 2-for-4 with a run scored to lead the main offensive producers for Clay. South Webster was led by Bailey’s two hits, a stolen base, and a run scored in three trips, while Rawlins went 1-for-3 with a run scored and McCleese went 1-for-2 with a walk and a run scored. Hadinger, Messer, and Smith all went 1-for-4 with an RBI. From a pitching standpoint, Oliver and Swain combined to go the distance, fanning 12 batters and allowing just seven hits while walking only a single batter. 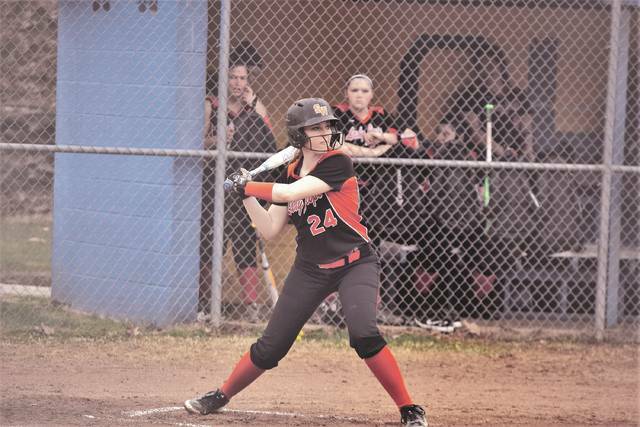 Messer went the distance alone for the Lady Jeeps, with the young freshman striking out four for South Webster.